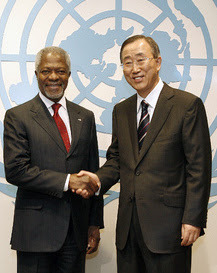 Ban Ki-Moon started yesterday as the new Secretary-General and seems to have a good start. He spoke to us staff and said he wants to increase efficiency by focusing on meritocracy (I heard from some other young staff members on there frustrations about inefficiency). 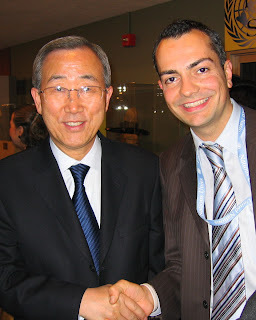 Here an article on Ban Ki-Moon taking over. Photo Credit for the left picture gos to UN Photo/Mark Garten (Photo # 134863).